Welcome to the hotel de la Tour Eiffel ! 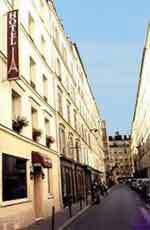 Charming hotel two stars located close to the Eiffel Tower and the Champs Elysées in a busy neighbourhood, in the middle of a typical parisian high-street shops. You will be welcomed by a warm and dynamic team, fluent in English who will guide you in your discover of Paris. Ecole Miitaire station is about 5 minutes away. RER C is 5 minutes away.